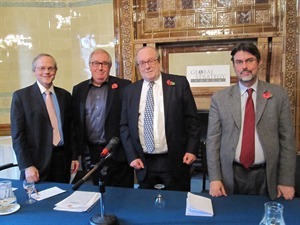 On 7th November, the day after the US election, GSF hosted a debate with Professor Michael Cox, Mark Fitzpatrick and Professor Anatol Lieven to discuss the future foreign policy implications and the direction the new administration is likely to take. Professor Michael Cox, Co-Director of LSE IDEAS and Professor of International Relations at LSE; Mark Fitzpatrick, the Director of the Non-Proliferation and Disarmament Programme at the International Institute for Strategic Studies and formerly of the US Department of State; and Professor Anatol Lieven, Chair of International Relations in the War Studies Department of King’s College London, and a senior fellow of the New America Foundation in Washington DC discussed the question ‘US Foreign Policy After The Election: Is It ‘Time To Change Course’?’ in a debate chaired by Lord Lothian. The three panellists each gave their perspectives on the question in the title. Professor Michael Cox said that the election was both remarkable and unremarkable: unremarkable for the fact that Obama won, and remarkable for the fact that he did, given that it was against a backdrop of an unemployment level of 7.5%-8%. This reflected the weakness of the Republican opposition. During the election campaign, he said that there was not much detailed analysis of foreign policy – as with Bill Clinton, it was ‘the economy, stupid’. He commented that it was the first election when Democrats could defend themselves on national security and since Obama was secure on foreign policy, the Republicans had no choice but to attack on the economy. However, he said that the perceptions by Americans of their position in the world did have some influence on campaigning – for example, there was China-bashing and Russia was named by Mitt Romney as the ‘number one political foe’ and the situation in the Middle East received campaign time. He drew attention to a paradox: although foreign policy was not talked about in detail during the campaign, outside the US, despite the lack of debate, there was a strong perception that who won the election would matter in terms of foreign policy. He said that the world in general preferred Obama (with the exception of Israel who had made strong efforts to shape the Jewish vote with Republicans), so most foreigners have the President they wanted. In his view, the question of whether it was time to change course might be recalibrated in time to reflect the fact that Obama has already done so. While there was no Obama Doctrine, through speeches and actions, there had been quite an important change of course and he mentioned the troop withdrawals from the Middle East; a reluctance to use or commit troops in Iraq and Afghanistan; and the reduction in military spending in support of this. Furthermore, there was recognition that the ‘shape of the world was changing irrevocably and irreversibly’ – it is no longer a transatlantic world and a power shift is taking place. This had been expressed in policy terms in the notion of the ‘pivot’ to Asia – Obama has bought into the theory of the BRICs and a world shaped more by Asia than Europe, so in his view, that philosophical shift has been made already. Secondly, there was a recognition of the limits of US power: although the ‘d’ word, ‘decline’, was avoided, Professor Cox said that in the Obama administration, there was acceptance that there are grave limitations to what America can do. His answer to the question, ‘Is it time to change course?’ – Obama has already done so. Professor Anatol Lieven commented that in certain respects, US foreign policy was bipartisan. The differences over Israel, for example, were blown up and in actual fact, are very small. He said that both parties, beyond the ‘froth and spume of electioneering’, were committed to US global leadership; and both were committed to the pivot to Asia, as a bulwark against China. On China, he said that the differences were essentially ones of nuance and rhetoric. He also felt that there was caution and restraint, especially when it came to military action and the desire to avoid military operation and major long-term commitments. Here, he said, all four US Services were on the same page. The Navy and Air Force future strategy is based on the idea of a potential air-sea battle against China and they do not want new entanglements in the Middle East. The Marine Corps in particular, do not want anything that will disturb an already hugely problematical withdrawal from Afghanistan. Professor Lieven said that there were a variety of consensuses at work in DC and also some severe constraints. He described the reset with Russia as a realist move by the Administration to reduce commitments in one part of the world in order to focus resources on another more dangerous area. The issue of NATO membership for Georgia and Ukraine in 2008 had implied the possibility of hot war, which contained ‘colossal internal dangers’, for which the subsequent reset was a ‘natural, limited, realist approach’. But he said that the US could not go further and formally abandon some commitments: NATO expansion remained the official policy. He believed Russia’s ability to help the US to be very limited and commented that had Russia had voted in favour of a Syrian resolution in the UN, the US would have then had to do something – very difficult in the light of the sheer intractability of the Middle East. Could the US distance itself from the Middle East? He said that Congress had a great deal of power in the foreign policy field, but he concluded that the US would continue down the policy rails set in recent years by Obama – unless ‘events, dear boy, events’ forced a difference stance. For example, an attack on Iran by Israel, or if the withdrawal from Afghanistan went badly wrong. In the latter case, he said that it was very important to note that while Vice-President Biden had said the US would be out Afghanistan in 2014, period, they would still retain hundreds of special forces and military advisers – who would be right in the middle of whatever happened in post-withdrawal period. The US military remained obsessed by memories of Saigon in 1975. The possibility was not very strong, but given that the risk of a rout was fairly serious, would Obama rethink his policy towards Afghanistan in the coming months? Mark Fitzpatrick said that the election result was a mandate for Obama to continue his policies and that he could now do so without certain impediments – such as having to face re-election. Obama had been very cautious in the last year, but now there may be more scope for manoeuvre or ‘more possibilities, less restraint’. He agreed with Anatol Lieven that there was still the impediment of Congress, ‘half of which does not want him to see any successes’ and said that that would not change much. He thought that much of US foreign policy over the next four years would be event driven – reactive rather than proactive – not least because this is Obama’s default stance. He said Obama was a cautious man who thought through the consequences, by contrast to George W Bush, who did not think through the consequences of military intervention. He focused his remarks on arms control and what Obama could do as an encore on arms control over the next four years. He pointed out that he could not carry Congress and get a 2/3rds majority in the Senate to ratify the Comprehensive Test Ban Treaty, nor could he carry global partners like Pakistan for a fissile materials treaty. The next step ought to be a comprehensive agreement on reducing weapons across the board, but to do so, Russia would have to be given something it valued, ‘and then you run into US domestic troubles’. He said that Iran was going to be a major foreign policy issue for the next four years. Benjamin Netanyahu had wanted to carry out a strike in 2010 and again this year, but there was heavy US pressure not to do so. But he cautioned that this was a red line for Israel and from Israel’s perspective, there were six to nine months remaining to solve this diplomatically. While Obama, in his view, was more inclined to try to pursue the diplomatic path and more able to, Iran was ‘moving close to where Israel will believe time is too short’. Next summer could prove decisive for Israel, even if Iran does nothing explicitly. This was very worrying and although there were some diplomatic opportunities – the P5+1 meeting in November for example, it was doubtful that either Iran or the West would make concessions. He said that the Iranians were very suspicious that if they gave an inch, the West would take a mile, while the US could not lift sanctions because they were a matter of law. The next six-nine months would thus be critical. If you would like to listen again to the debate, please click here.